Toyota announced today that it has newly introduced SimpleFuel to its Motomachi Plant in Toyota City, Aichi Prefecture. 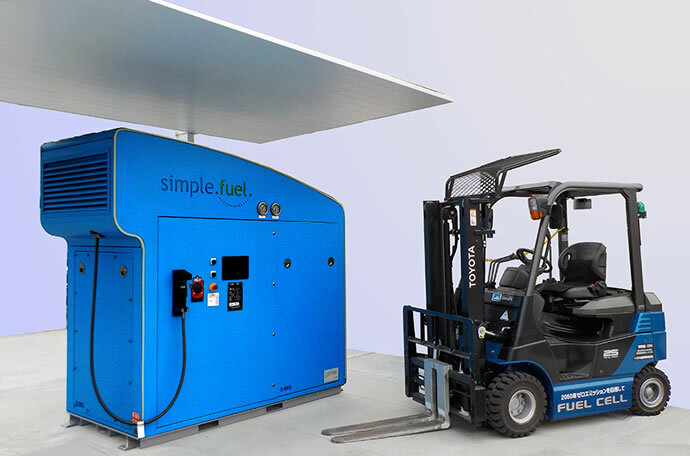 SimpleFuel is a simplified hydrogen station that uses electricity from solar panels at the plant site to produce low-carbon hydrogen from the electrolysis of water, which is then supplied to fuel-cell forklifts (FC forklifts) after it is compressed and pressurized. It can produce up to 99 Nm3/day (approx. 8.8 kg/day) of hydrogen, enough to fuel seven or eight FC forklifts. Its compact size means it can be installed in small spaces, making it suitable for refueling FC forklifts within the plant. A hydrogen station has been running at Motomachi Plant since March 2018, in conjunction with the increasing numbers of FC forklifts in use there. By working to support fueling through the use of SimpleFuel, with an eye toward the rising demand for hydrogen, Toyota aims to reduce CO2 emissions at the Motomachi Plant and intends to support the accumulation of new technologies and knowledge. To reduce CO2 emissions at its plants, Toyota intends to replace existing conventional forklifts with fuel cell forklifts.